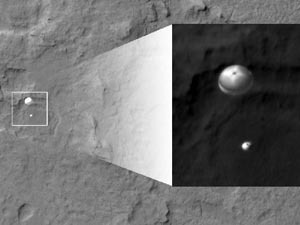 Curiosity, the American space agency NASA’s rover, parachuted down and made a safe landing on the surface of Mars on August 6. Curiosity is basically a car-sized robot on wheels with a laboratory inside it. It will be busy digging, gathering, and analyzing soil and rocks on Mars. The robot has a drill at the end of one of its arms which will allow it to take samples from deep inside rocks. It has scientific instruments that can study the chemical make-up of the rocks. It even has a laser that can zap rocks and study what the rocks are made up of from a distance. You can watch a video here. You can learn more about Curiosity here. Curiosity has a friend on Mars. Opportunity is the name of a rover that has been on Mars since 2004, and is still roaming around on the planet. There are also a few spacecrafts still orbiting Mars and sending data back to Earth. Mars Odyssey has been orbiting the planet since 2001, and it has set a record of being the longest-serving spacecraft at Mars. The Mars Express Orbiter has been orbiting the planet since 2003, while the Mars Reconnaissance Orbiter has been doing so since 2006.